OH MY GOODNESS. I haven't smiled that big in a long time. I'm not kidding. Today we visited the Arusha School to meet the kids for the first time. It's just one of the schools we'll be working at but it's extremely close to our apartments. As three of us walked toward the entrance, a group of tiny kids (probably kindergarten or the equivalent) saw us through the fence and started yelling "Hi! hi! hi! .. hiiii!" A few ran up to the gate and walked alongside us. They were smiling SO big, how could I not smile back?? The second we stepped foot onto the campus, the entire group swarmed us, a few of the braver ones grabbing my hands and skirt and smiling up at me. I felt so big, so I knelt down and as I did so, one of the boys knelt too just because I was doing it, maintaining the height difference that I just tried to eliminate. They kept calling us "teacher, teacher" and smiling and laughing and smiling. The smile on MY face lasted a good 5 minutes. I was completely overcome by an overwhelming feeling of joy. It was cleansing, it was beautiful, it was so real. We had to leave the kids at an archway in the bushes, because we were coming to see the older bunch of kids. I didn't want to leave them, but the next group greeted us with the same kind of love, although with slightly more hesitation at first. We essentially just ran around and played games for an hour and a half, just getting familiar with each other and having fun. There is no word better than "swarm" to describe how I felt in the center of the biggest, loudest group hug I've ever experienced, and this happened multiple times. By the end, all the girls were giving me kisses on the cheek to say goodbye. "Teacher, teacher, a kiss please, come" and so I'd lean down a tiny bit and they'd kiss me on the cheek... sometimes more than once. 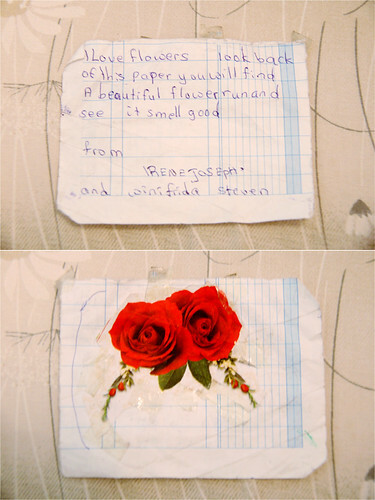 Right before we left, Irene handed a note to Esther and me and I felt that I could just explode with happiness. We love hearing how you are doing and I am jealous have the great opportunity you are having. Don't waste a moment and express such love for the children. Best of luck.